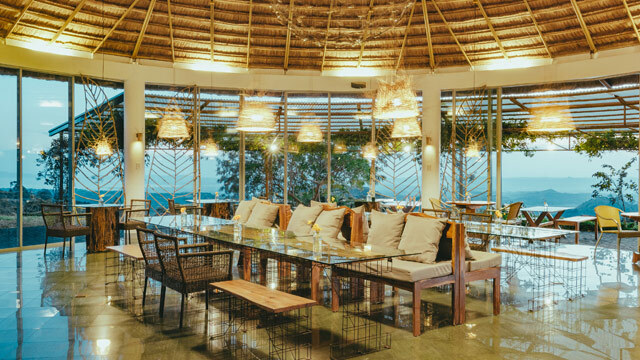 Nothing beats dining with a 360-degree view of the city, Laguna de Bay, and Sierra Madre. While being updated is a must these days, staying online 24/7 can take its toll on us, too. Curating social media feeds and creating the perfect online profile can be tiring, and many have been taking weekly digital detox to rediscover what it’s like to stay offline even for a couple of days. Aside from picking up a new hobby, revisiting well-loved spots, and maximizing time spent at home, many are discovering the wonders of the great outdoors by setting up camping trips and hiking adventures. The Masungi Georeserve has been a popular destination as it brings visitors closer to nature through exciting trails and breathtaking pathways. 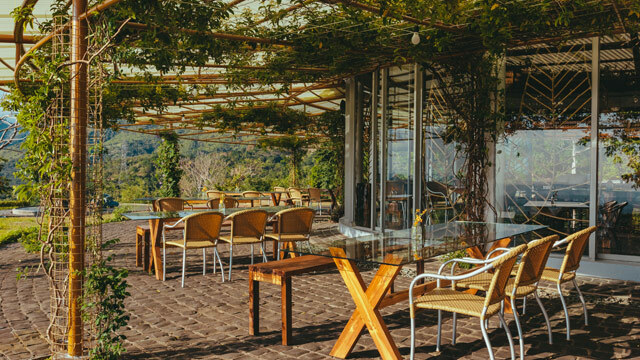 As if being surrounded by the beauty of nature is not enough, it treats guests to a lovely limestone landscape that will surely help you forget about the dizzying world of social media. Nestled within the rainforests of Rizal, the Masungi Georeserve is a conservation area and rustic rock garden that offers a close encounter with wildlife and plant species. 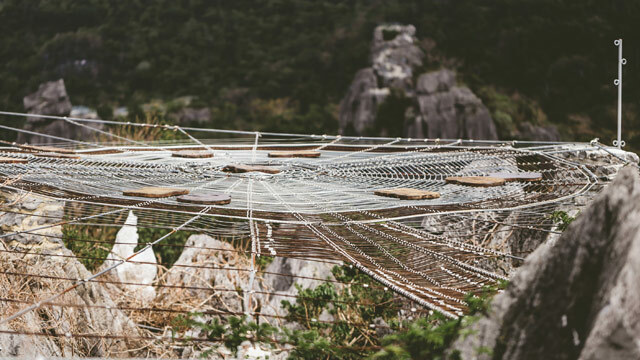 If you’ve seen the photos, we’re sure you’ve been curious about those giant, web-like platforms that offer a view of the surroundings. Traversing the Discovery Trail which lasts for three to four hours will bring you to stops like Yungib ni Ruben, a cave formation that’s part of a karst landscape; Tatay, a tall natural sculpture and formation composed of rocks; and Liwasan, a valley-like area with a bird bath and a rest area meant for relaxation, to name a few. Anticipating the need to have a good meal after a long yet fulfilling trek, the team behind Masungi added a secret escape within the area—the Silayan Dining Room. “It’s part of the geotourism model of Masungi which highlights tourism that enhances the geographical character of an area while empowering communities," shares Billie Crystal Dumaliang, Masungi’s advocacy specialist. "Silayan was initially opened to serve hungry guests after their trail visits, so it was initially exclusive to the trail guests. "This year, we slowly launched three set menus for non-trail guests since some of the guests wanted to come back with their families and friends to share some of the unique food we serve." From afar, Silayan looks intriguing, like a special escape you’d want to enter and explore. 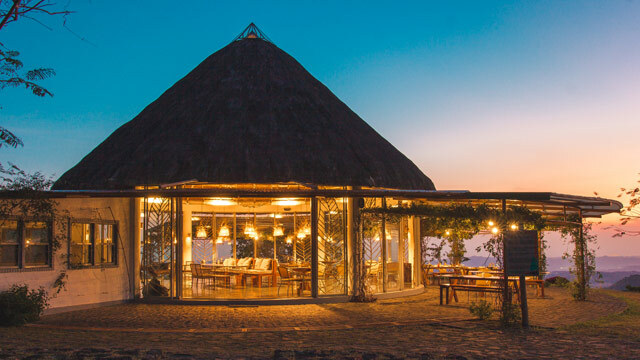 According to Billie, their in-house design and engineering team took the lead in designing and constructing the glass hut. "We collaborated with an independent interior designer for layout planning. The main direction was to go as local as possible, to use only local and recycled materials found within the premises,” Billie adds. 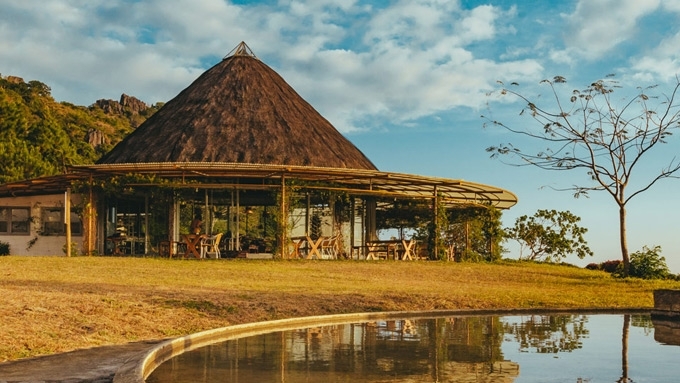 The roof of the hut is made up of pure cogon grass with corrugated plastic roofing protecting the outdoor tables from the elements. 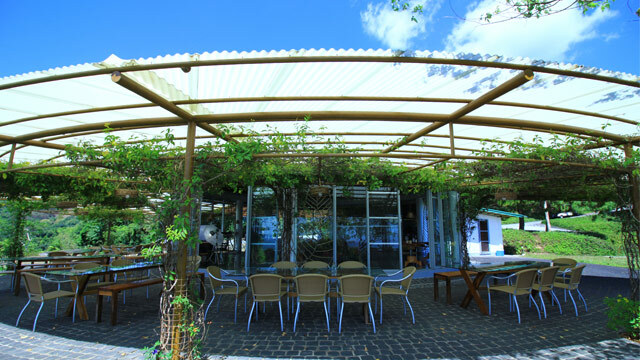 Adding a whimsical appeal to Silayan are the climbing vines sprucing up the poles and trellises supporting the roof. "The parts of our tables are made from tree trunks that fell during Ondoy. Meanwhile, the wall accents are made from bamboo," adds Billie. Dining outdoors allows guests to relish the view while enjoying a hearty meal. Benches paired with matching chairs are meant for big groups and family get-togethers. 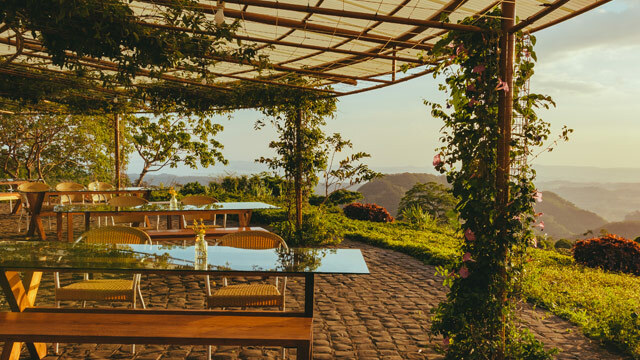 "Guests can expect to be enveloped in nature and be amazed by the 360-degree view of the city, the Sierra Madre, and the Laguna de Bay. "They will enjoy the privacy that only a mountain dining experience can offer as well as food, sauces, and other intriguing concoctions you can't find anywhere else," she adds. The tables have glass tabletops and wooden legs—creating a balance between rustic and modern elements. 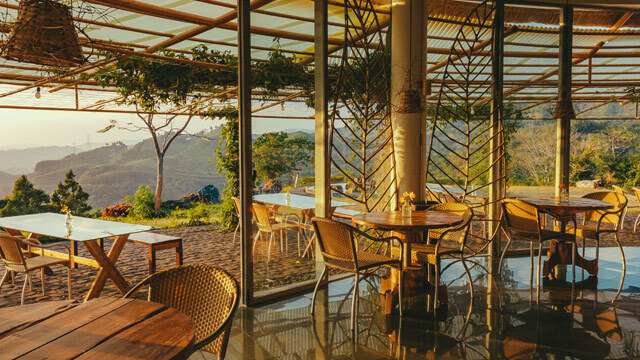 With a view as beautiful as this, we won't mind staying for a couple of hours more for dessert, coffee, and tea. Inside the hut are smaller round tables meant for two. What we love best are the rustic-inspired elements and accessories that add warmth to the space. Perhaps to conceal the columns supporting the structure, huge leaf-like accents liven up corners, alluding to the refreshing surroundings. Hosting a huge get-together after a long trek? The Silayan Dining Room has enough space to accommodate a big group. While some tables showcase the beauty of wood and upcycling, there are also pieces highlighting the beauty of metal. When combined, these two elements make a lovely and comfy combination that suits the restaurant's ambiance. Even the chosen lighting pieces add to the ethereal ambiance, making one feel like they're in a secret wonderland.